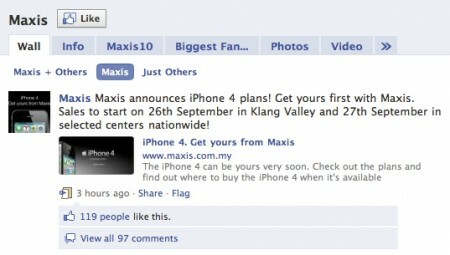 Maxis, one of the iPhone providers in Malaysia, has announced that they will start selling the iPhone 4 on the 26th of September in Klang Valley and in “selected centers nationwide” on September 27. It was announced on the company’s Facebook page. Thanks Dr Ghassan for the heads up. Malaysia’s other iPhone provider, DiGi, has dedicated a webpage for the iPhone 4 but did not announce a release date. By the way according to this document on Apple’s site both DiGi and Maxis are selling unlocked iPhones.